00:31 octacian How can I make a player no longer take damage for my gamemode mod? 00:34 octacian huh, seems as though it isn't possible at all. 01:41 sofar oh christ, when I stop committing to other projects and finish one? 05:06 octacian sofar: interesting singleplayer game? I'm hooked..? 05:09 VanessaE sofar: can it cross-fade over the course of the day? 05:09 octacian sofar: interesting mod! 05:31 sofar MT doesn't render jpg? 05:32 VanessaE sure it does. 05:40 sofar light level, or color? 05:40 sofar or light level of the fog? 05:47 VanessaE what happens if the skybox image has alpha? 09:20 tenplus1 hows the day ? 09:21 Shara how about there? 12:08 * CWz was walking though forest when suddenly he was attacked by a Karmic Kuala and a Maverick Meerkat. 16:20 benrob0329 sofar: dang, that's pretty neat! 16:24 Shara Mine are lazy ones currently though. Rather than pretty ones. 16:28 Shara I just keep wishing for a way to have an animated sun/moon in custom skyboxes. 16:33 benrob0329 sofar: can you increase the amount of chat log weechat saves? 17:04 Shara Hmm, paramat how do you mean? 17:23 Jordach_ sofar, not just be smart and use the dynamic sky for colouring? 17:26 sofar tenplus1: I am neither legally obligated to take down the video, nor do I feel that I violated anyones IP or copyrights in making that video. But, since you're hell-bent on losing on free publicity for your own project, I'm marking the video private. Your loss, not mine. Have a nice day. 17:28 Shara Jordach_: yea, that's why on my servers I merely request that people talk to me before filming. 17:32 Shara Lag might not be an issue in this case. 17:36 sofar nore: yes, didn't you see my particle count test? 17:42 Krock "Can i run this at 5k 80fps? | Intel pentium 2 800mhz single core | integrated graphics | 512mb of ram "
17:49 rubenwardy where does one get those sounds? 17:49 rubenwardy is it the PR? 17:49 tenplus1 from the MarkBu video ? 17:49 CWz Terasolagy = badly optimized than, benrob0329 ? 17:51 Krock not the carts are laggy, the servers are. 17:53 Krock nore, hehe. That's real speed! 17:55 benrob0329 not the most correct when it comes to prediction, but it worked, and it worked well. 18:01 tenplus1 did the shadow glitches get fixed for those ? 18:08 red-004 is it not rebased? 19:09 tenplus1 who's winning ? 19:09 tenplus1 lol, what ya changing ? 19:28 sofar Jordach_: how does 50% alpha look? 19:30 Shara Jordach_: Not sure what I can say other than, please make it so. 19:52 Shara Hmm, so my huge mod update which shrunk the size of mod directory to abotu a third of what it was only broke moreblocks and a couple of homedecor nodes I overlooked. 19:58 sofar what do you mean 2? 19:58 sofar too large file size? 20:03 sofar and give the sets a "name"
20:14 sofar rubenwardy: did you tune the values? 20:28 VanessaE rubenwardy: did you see my HDX screenshot with that mod? 20:35 RobbieF heya benrob0329 what's new? 20:35 tenplus1 what's new with you ? 20:35 benrob0329 Not much, still on "vacation"
20:40 RobbieF that's great sofar! Shara knows I assume? 20:49 Krock can someone confirm that double-jumps (sneak) are possible with the current HEAD? 20:50 Thomas-S Krock, I can confirm this. 21:18 RobbieF My show is NC. What's the problem with that? 21:18 RobbieF People can use it for commercial purposes, but requires them get written permission first. 21:23 benrob0329 I see a lot of stuff that'd be awesome to use, but the creator tacks on the NC and makes it unusable. 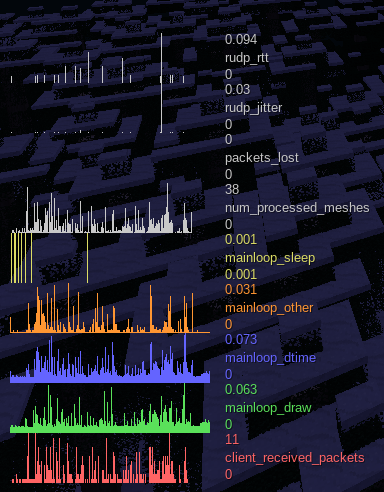 21:24 sofar NC is basically a sign saying "ask me"
21:24 benrob0329 And "screw wikipedia"
21:32 Jordach_ sofar, https://public.etherpad-mozilla.org/p/MT-skybox thoughts on default.clouds? 22:07 Fixer wth is this? 22:13 benrob0329 perhaps sneak + falling = bracing? 22:15 benrob0329 Heck, if we're redoing sneak, why not take the idea and run with it? 22:44 Fixer it is about not leaking chat into youtube? 22:52 sofar they said "maybe?!" 23:01 sofar VanessaE: what's your monthly bandwidth consumption for VE servers? 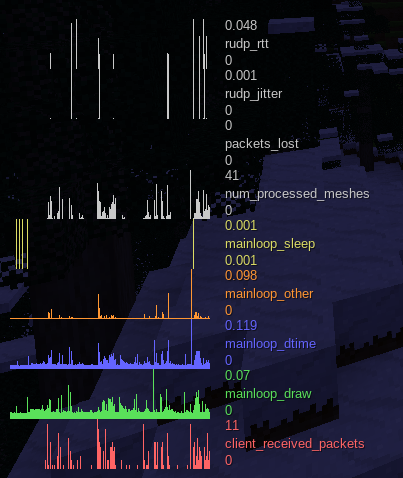 23:01 sofar rubenwardy: your ctf server? 23:02 sofar 5 players 430kbit /sec? 23:02 sofar or is it kbyte/sec? 23:03 sofar VanessaE: 140gb / month? 23:03 sofar does that sound reasonable? 23:05 VanessaE hm. nothing useful on the control panel there either. 23:07 Fixer did i say about terasology? 23:11 Fixer nore: does it improve fps? 23:13 VanessaE isn't the biggest cause of stutter the mesh gen stalling out the renderer? 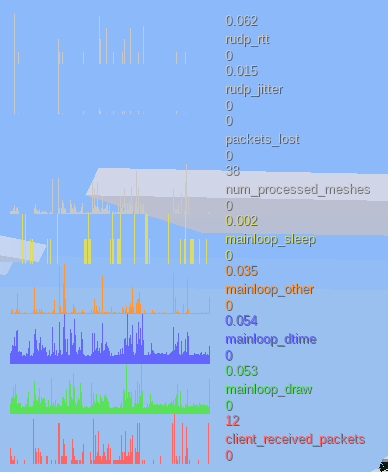 23:15 nore I mean, why recomputing the mesh should pause the renderer? 23:16 VanessaE nore: because no threads? 23:16 nore VanessaE: it is not running in its own thread? 23:16 nore Fixer: what is it then? 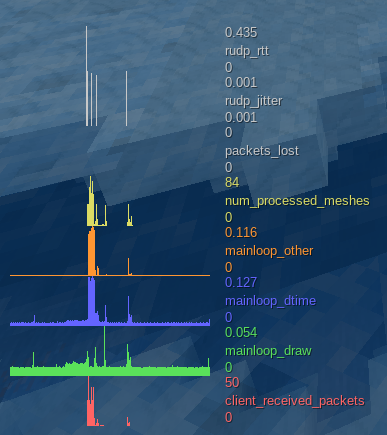 23:27 rubenwardy what are you doing to get 84 processed meshes in one tick, and barely any packets? 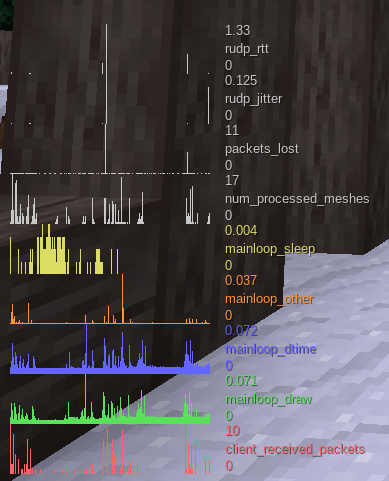 23:29 rubenwardy what does the graph look like for you just flying around normally, loading blocks? 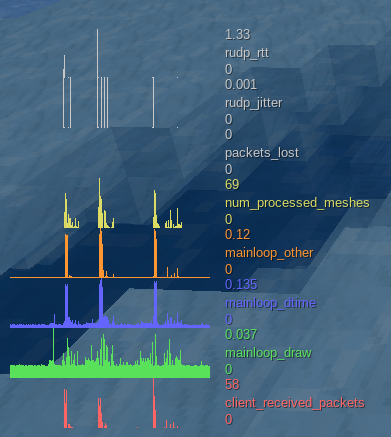 23:29 sofar it may be async, but does the mainloop wait for the thread to finish each server step? 23:31 rubenwardy is that singleplayer? 23:38 Fixer what can you say about gameplay when you have 300 fps and it stutters down to 14 fps for an instant?